This needs some 'splainin' about why this is a big thing for me. The first Harry Potter book I bought was Harry Potter and the Goblet of Fire back in June of 2000, right after it had been released. I figured at the time that as fast as it was going, it might be nice to have a first edition for a collector's item. I didn't read it then though. A few months later I bought a paperback copy of the first book in the series, started to read it and then dropped it: seemed kinda boring at the time. Then about six months after that I decided to see what the big fuss was about, made myself plow through Harry Potter and the Sorceror's Stone... and thoroughly loved it! 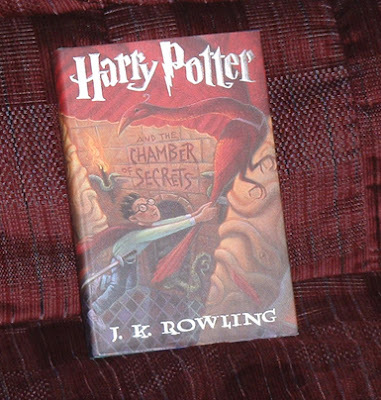 So then I bought a paperback of the next book: Harry Potter and the Chamber of Secrets. Then I bought the hardback of Harry Potter and the Prisoner of Azkaban while visiting Lisa on the 4th of July in 2001. I read that and finally started reading Goblet of Fire around Christmas of that year. The two books that followed, I bought the hardcovers when they went on sale at midnight on their publications dates. And going back to Harry Potter and the Sorceror's Stone: I bought a hardcover of that when I was in Indianapolis for Star Wars Celebration II in 2002. I ran out of the convention center to the B. Dalton's down the street, got it and brought it back so that I could get it autographed by Warwick Davis (who plays Flitwick in the movies), as a graduation present for Lisa. What this all means is that eventually, we wound up with hardcover editions of all the Harry Potter books except for Harry Potter and the Chamber of Secrets. And it's bugged me to no end that there was that hole in the series as they sat on our bookshelves. It will become a complete set this coming July, when Harry Potter and the Deathly Hallows - the final book in the series - gets published. And then we will have all of the Harry Potter books that we can show off and cherish and someday read to our children from. "Now if only there could be nine Star Wars movies sitting on my DVD shelf..."
A bit OT: I just discovered on my blog that I had the comment moderation on. And for the past year or so I've been wondering why no one was commenting on my blog. I discovered this mistake when I went to add a blog to my small list of favorite sites. I found seven old comments all waiting to be published on my blog. I published them all today. I've turned off the comment moderation so that peoples comments can now be seen when they post them.